April's around the corner and you know what that means -- Write_On! We're so excited about this year's campaign. Write_On's community of letter-lovers continues to grow and we've personally noticed our letter-writing practice grow stronger and stronger over the past year, thanks to the habit-forming Write_On challenge! Dashing off a thoughtful hand-written note comes more easily these days, and it feels great. To get ready for this year's Write_On challenge, we've been making lists of people to write to and stockpiling our favorite cards, pens and stamps. Of course, we'll be using this year's signature Write_On kits (available here on a pay-what-you-like scale while supplies last!) and our new weekly bundles. However, some of our favorite Write_On finds this year, featured on the Write_On Resources page, is this gorgeous new card kit by Rhea Abramson founder of NY Letter-Writing Society and Mail More Love, and the Send More Love vintage stamp shop (to name a few)! If you feel like you're running out of steam we encourage you to visit our resources page- no shortage of tools, inspiration, and community events there! The kit itself includes 3 letterpress cards -- just enough to get you started -- but the kicker is that it it *also* includes a " / 30" rubber stamp so can number every piece of mail you send for the Write_On Challenge! So satisfying! We hope you're as excited as we are for this year's challenge! We look forward to joining you in April, and be sure to tag #Write_On so we can see what you're up to! it's International Women's Day, and we're taking the day off to support the importance of women's rights. We encourage you to take a stand with us by using this day to praise the women in your life, to shop local and at women and minority owned businesses, and to wear red in solidarity (or sport your Wild Feminist enamel pin if you have one!). To celebrate International Women's Day we created two free printable designs (download below) to print at home and color in. What better way to kick back and relax than to color in an empowering message? Coloring is proven to relieve stress and anxiety, improve self-esteem and self-awareness, and to promote a mindful and meditative state. More on that here. If you're interested in more of our coloring and DIY projects, we're publishing a DIY book called Happy Mail and it's chock-ull of ideas and inspiration. The book is now available to pre-order through your local bookstore and available online here. We couldn't be more excited about our new partnership with Mixbook! Bringing you fun & customizable Hello!Lucky designs that translate perfectly into wall calendars, and soon photo books! Our new Wild & Free calendar is now available through Mixbook, and this week we are offering a buy one get one free offer with code HLBOGO, OR enter to win a Wild & Free calendar for you AND two friends through our Instagram account - @helloluckycards. Makes for a fun Christmas gift too, just sayin'! 10 cards for $10 now through July 22nd (or until supplies last). Everyday and Holiday bundles available. We’re appalled by the headlines of today, and if there’s anything we’ve learned from the recent Brexit vote, it’s that showing up to take a stand effects tomorrow. Voter turnout has a major impact, in other words, your vote DOES count. We encourage you to not just hope for a better future, vote for one. The Future is in Your Hands is an initiative to encourage young people to get out and vote. Because equal rights, college access, and protecting our planet is our future. This next election will set the framework for our justice system for DECADES, and it’s literally in your hands. Together let’s stand up, speak out, and demand change. To get involved, share the above graphic on social media and follow us on Instagram, Twitter, and Facebook to receive regular updates. You can also enter our Instagram contest to receive a limited edition hand-carved & block printed sweatshirt, tote or T by tagging your friends. Write_On kick-off party in San Francisco! Join us April 7th from 6pm-9pm at Coffee Bar in San Francisco for our Write_On kick-off party co-hosted with The Dinner Party. RSVP for the free event today! We are so excited to announce our new enamel pin collection! Now you can wear Hello!Lucky at $10 a pop, and they are the perfect gift for your gal pals! They come backed with a unique mini greeting with space on the other side for a personal note. "Put a pin on it" is totally the new "put a bird on it". Check out these adorable and super fun printable Palentines we did for How Life Unfolds! Download the free printables below! MONSTROUS GIVEAWAY & FREE PRINTABLES! We’re gearing up for Halloween with one of our all time favorite craft tools. With the Silhouette America Portrait, you’ll have your own personal craft assistant. You be the designer and let the Silhouette table top cutting machine do the rest. Head to Instagram to enter the giveaway- @helloluckycards, @silhouetteamerica. Winner announced next Wednesday 10/13/14. Don't be fooled by the Portrait's small footprint—it can cut over 100 materials including paper, cardstock, vinyl, chipboard, fabric, and more. We use it for just about every holiday, trade show, and craft fair, so safe to say it's a Hello!Lucky staple! Because everyone is a WINNER in our book, we created free monster shadow puppet printables, just in time for Halloween! Don't have a Silhouette portrait? choose the PDF's below! For Silhouette products please choose DXF files. Print out using your favorite construction paper palette using 8.5"x11". It's National Thinking Of You week in the U.K., so we sat down and wrote a few notes to loved ones who have been on our minds lately. We're still working on forming the habit, so sometimes we need to be prompted to take time out of our day to write. The benefits of writing are proven to expand beyond that of the recipient, find out more about the psychological gains of writing here. We hope you'll join us in the Write_On movement this year! Summer the perfect time for a jungle / tropical-themed fling. We gathered some of our favorite inspiration for a wild party! DIY tiger pinata from Playful: Fun Projects to Make With + For Kids via MerMag A palette of black and white with pops of neon or bright color is a fresh, modern take on the jungle theme. Being sisters and co-owners of Hello!Lucky is tons of fun and makes some of the stress of running a small business a little more manageable -- as sisters, we can be totally honest with each other and our shared genes and upbringing mean that we tend to share the same work ethic and goals (not to mention a similarly juvenile sense of humor!). Head on over to Say Yes blog to get the skinny on how we're different, what used to drive us crazy as kids, and what we admire most about each other. Are you in business with your sister? We'd love to hear your stories and comments! We recently had the pleasure of sitting down with the lovely Julia Hohne of Mrs. Vintage blog to talk about our evolving business for her fabulous new podcast, The Company You Keep, which highlights the experiences of small creative business owners. We discuss everything from what inspired us to start our business, how we got our first order, how we established our distribution, our entry and exit from the custom wedding invitation market, our decision to collaborate with Egg Press in 2013 and shut down our SF studio, and lots more! You can listen on iTunes, or tune in here! Please feel free to leave comments, questions, or feedback -- we'd love to continue the conversation with you! Hello!Lucky + Recycled Paper Greetings at Target! Today's the day! We launched the collection of glittery, fabulous offset printed cards we created with Recycled Paper Greetings, exclusively for Target! We had so much fun getting creative with color, glitter, foil, and more! 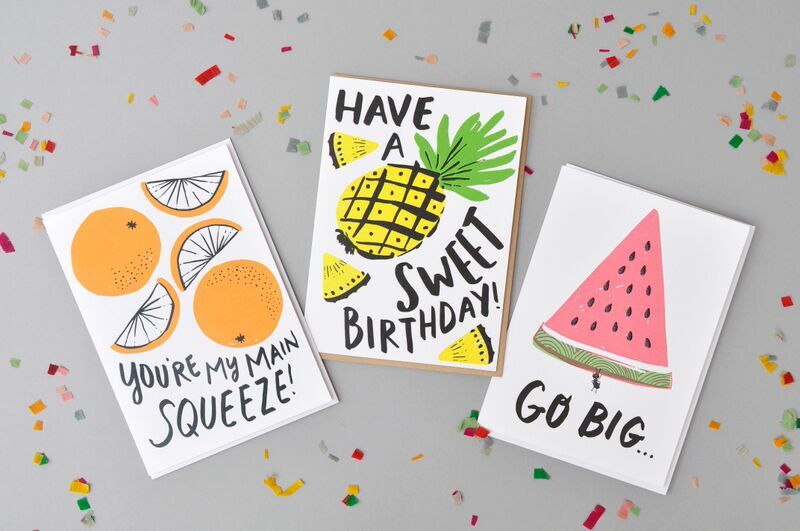 Our cool collection of 64 cards will be at Target stores ALL SUMMER LONG! A little something shiny to make your day! Thanks to the fabulous gals at Recycled Paper Greetings for bringing our collection to life! We love the concept behind fellow San Francisco business Brit + Co, our go-to source for creative workshops and community. In April, Eunice teamed up with them to teach an online Letterpress at Home class. Even sweeter? Brit + Co is offering 20% off all classes and DIY kits (discount taken at checkout, ends tonight at 11:59 PST) for its Week of Making! This Brit + Co video pretty much sums up our view on creativity - we love it! We're all creative, so go ahead and make something today! Go, go! Yay! Recycled Paper Greetings for Target Sneak Peak! We're so thrilled to share this sneak peak of a collection of 64 cards we created for Recycled Paper Greetings exclusively for Target! These foil-stamped, glittery creations will be available next week at a Target near you! We'll be heading over to our neighborhood Target Monday to see the collection in person! So exciting! School's out for summer! Hello, toy organization! You’ve just gotten home from a busy day and all paths forward are littered with toys. Your kids are ticking time bombs at this hour, so you can’t slow down. You pick your way through the landmines, but a misstep lands your heel on a plastic lizard. You yelp in pain, and in synchronized call-and-response, your kids start to wail. One of our Summer goals is to keep our kids' toys organized and our sanity in check! Between Eunice and Sabrina, we have five kids under five -- a surefire recipe for toy disaster! (“Please can I just move out of my house and into a FEMA trailer? Because it really is that bad most days.”). We needed inspiration, so we chatted with San Francisco organization guru (and former elementary school teacher) Pam Parker, to collect some sanity-saving tips for toy organization. Our goal? Get our kids' toys organized in a consistent, aesthetically-pleasing manner that invites them to play, create, and put away! Once your toys are contained, you need useful and beautiful toy storage labels, ideally with images that make them legible to pre-readers. We put our creative caps on and whipped out these free downloads that you can print at home. We recommend printing the labels on 8.5” x 11” glossy paper, trimming them, and inserting them into a plastic photo insert sleeve so you can easily swap them out as your storage needs change. 1. Sort: Sort like with like (e.g. dolls with dolls, blocks with blocks, Legos with legos; novelty items with novelty items; it's okay to have a miscellaneous bin / category). Our labels give you some popular categories to get you going. 3. Assess: Assess which toys you / your children actually want to keep, and which could be put away for a rainy day or donated to someone who really needs it. Involve them in the process by asking them to set aside one toy that they want to give away to a child who is needs more toys to play with. Keep it in a garage or storage area for 1 week just in case; if they don't ask for it, then get rid of it! 4. Contain: Contain each type of toy in a "just right"-sized bin -- it should neither be too large or too small. Use the size of the bin as a natural limit to what is contained in it -- if the bin starts becoming to small to contain its contents, it might be a signal that it's time to purge...or upgrade to a larger bin if necessary. Use our lovely labels to make it easy for pre-literate kids to help themselves to what they want and put away their toys when they're done. 5. Maintain: Once your system in set-up, keep it up, and enlist your kids to do the same. And now, go put a Sponge Bob bandaid on that heel wound! Spanish Tapas Party on Oh Happy Day! We had a ball putting together inspiration for a Spanish Tapas Party for Oh Happy Day. With all the fab swag available at the Oh Happy Day party shop, it was a piece of cake! And it didn't hurt to have Hello!Lucky's star intern Imogen (aka "tiny Spanish Dancer") on hand to get the party started! Check out the full post with DIY instructions here. Olé! We've been getting requests for a version of our father's day diy templates updated for 2015. We aim to please, so here they are! Download the links below and print these puppies up for your favorite father figure! Father's Day is right around the corner and this year we've got your one-of-a-kind gifts covered. You can jazz up a simple pair of socks, a bottle of wine, or a bottle of beer with these manly labels we've designed. Do you have a handsome and debonaire Dad? Print out our matching labels for a black pair of socks and a nice bottle of wine. We even created a slick card to match! Is your Dad more on the rugged side? Why not make some beer and a pair of white socks a little more special with our free matching labels? We printed ours on label paper which made sticking them to the bottles and socks a little easier, but these would look just as nice printed on regular white paper or card stock. Simply click on the links below to print your free Father's Day cards and labels. Enjoy! And as always we love seeing our printables in action - so send us pics or post them directly to our Facebook page. And tell Dad we said Happy Father's Day too. The National Stationery Show is one of our favorite times of the year. Like summer camp, our industry pals travel from all of the country and across the pond to showcase their latest and greatest. It's always so inspiring to see the works of other stationers. We love the diversity amongst style and relish in the creative energy flowing through The Javits. Getting to attend all the fabulous events that coincide with NSS week and meeting some of our most admired tastemakers is A DREAM. This year we were super honored to be a judge at the LOUIE Awards and a speaker at the blogging seminar. We've gathered up some shots of our booth and a few favorites from around the show to share with you! Enjoy. We were lucky enough to have Bramble Workshop help with our booth decor. She created custom handmade cacti out of paper mache to sit on our table and hang from our walls. The honeycombs are from the newly launched Oh Happy Day Party Shop and the confetti we printed with our Silhouette Cameo machine out of vinyl. The Great Lakes Goods booth. The Print Arms booth and their epic double sided pillow case!